Heat the oil in a large, heavy non-stick skillet over medium-high hit (drop a small piece of tortilla into the oil, and if the oil bubbles vigorously immediately, it’s hot enough.) Add the tortillas wedges. Fry until they are slightly crispy and browned, then remove from oil and let drain. Put the salsa into a skilled pan with the onion, salt and black pepper and reduce the heat to low. Simmer, stirring often, for about 15 min then add the fried tortilla wedges and the chicken. Continue summering for a couple of minutes, taste for seasoning, add salt as needed and remove from the heat. Serve with sour cream, fresh chopped onion and cheese. Buen Provecho!! 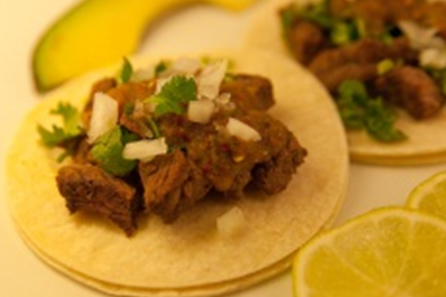 Warm the tortillas for 30 seconds in the microwave for easy rolling then place an equal amount of beef on each. You can either roll and secure the tortillas with toothpicks or just fold in half. Heat the oil over medium-high and when it’s hot begin frying 2 or 3 tacos at a time until golden on all sides. Remove and drain. Repeat,keeping the tacos warm in the oven until done. When done, place 5 tacos on each plate and top with sour cream, lettuce and cheese. You can change the filling depending on your preference-pork, chicken, tuna or veggies. Servewith guacamole, cactus salad and salsa…Muy rico…Buen Provecho!! Melt butter in medium saucepan over medium heat. Add bell pepper, onion and oregano. Cook for 3 to 4 minutes. Stir in broth, salsa, corn and salt. Bring to boil then reduce heat to low and cook for 5 minutes. Heat vegetable oil in medium skillet over medium-high heat. Add tortilla strips. Cook for 3 to 4 minutes or until tender. Serve in soup bowls. 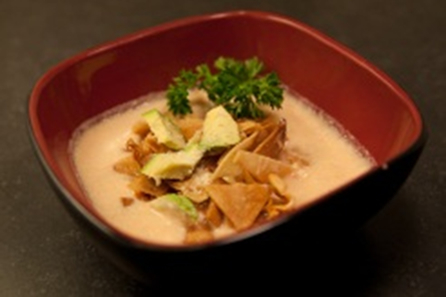 Top with tortilla strips, cheese and dollop of sour cream. Preheat oven to 350 F. In a skillet, brown ground beef over medium-high heat. Drain. Stir in ½ Italian sauce and corn. In a small round baking dish, spread Italian sauce. Arrange 2 tortillas over the sauce, overlapping edges slightly. Layer beef mixture, cheese and Italian sauce over tortillas; repeat layers, ending with tortillas. Spread tortillas with Italian sauce. Bake 30 minutes, then top with remaining cheese and bake an additional 10 minutes or until Italian sauce is bubbling and cheese melted. Buen Provecho!! Tip: Substitute refried beans for ground beef for a meatless main dish. 3 poblano peppers, stemmed, seeded and cut in half. Combine lime juice, garlic, cumin, oil and salt in small bowl. Coat chicken with paste, cover and refrigerate at least 15 minutes. Grill chicken on covered grill over medium-high heat 5 minutes per side until no longer pink in the center. Grill poblano peppers, skin side down, 8 minutes until skin is burned. Place peppers in large resealable plastic food storage bag and seal it. Let stand 5 to 7 minutes; remove skin. Cut chicken and peppers into strips. Arrange chicken, pepper, avocado and cheese on half of each tortilla. Fold other half of tortilla over filling. Grill quesadillas on covered grill over medium heat, 30 seconds to 1 minute per side until cheese is melted. Add hot salsa and enjoy it. Cook the beef. 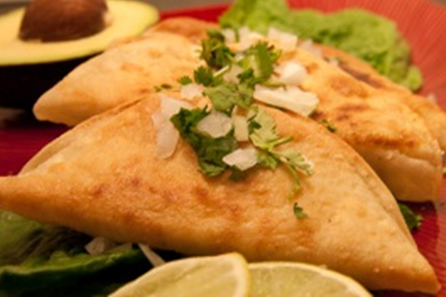 Warm up tortillas on a griddle 30 seconds to 1 minute per side untilsoft and hot. Wrap them in a tea towel and place into a plastic bag to keep them hot until you get them all done. Use 2 tortillas to make one taco. Place them on the plate. Add beef, beans, cilantro, onion and few drops of lime juice. 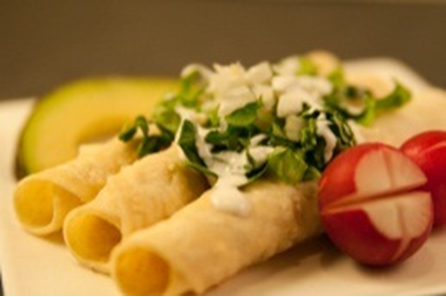 Serve with guacamole and radishes and top them with hot salsa. Tip: Change the meat for a variety of tastes. Try pork, chicken, tuna, eggs, just beans or veggies.